Since I still have a heap of batts sitting on my dining room table, it’s been hard to resist spinning them. I started with a batt that consisted primarily of brown Romney locks, a bit of bright red Wensleydale top, some sparkles, and some unknown wool locks. I settled on using my smallest top whorl spindle and spun the yarn “fine” (which for me isn’t super fine). It’s probably contradictory to what batts are all about, but I don’t spin interesting art yarn anyway. The fiber was enjoyable to spin and the yarn came out satisfactory. Nothing too wildly exciting, but unusual compared to spinning from top. Two finished skeins and one in progress. Spindle from Spanish Peacock. 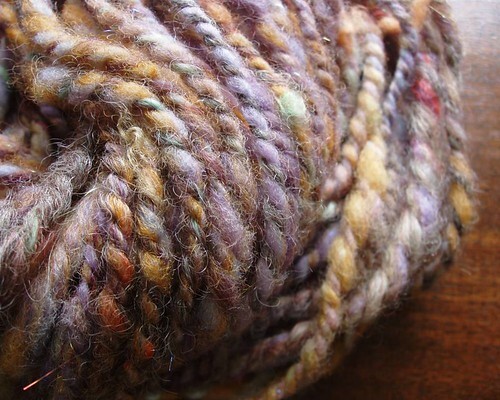 Later I grabbed a few random batts and spun them into a chunky yarn using my wheel. I tried to pick out the most boring of the bunch (so they wouldn’t end up on my sale table) and it shows. The yarn is a bit awkward looking, but I enjoyed creating it. "Melody", handspun bulky weight yarn. Also, I’ve decided my batts are not “art batts”, rather I am calling them “fantasy batts”. They aren’t quite as wild as art batts, but with the sparkle and the colors, I kept thinking about fairies. However, “fairy batts” just make me think of bats you hit fairies with, so I didn’t want to put that image in anyone’s head. Allow these delightful batts to bring a little bit of fantasy to your spinning! I’ve never spun from a batt before and you’re making me awfully curious. I love the yarn…Good job! 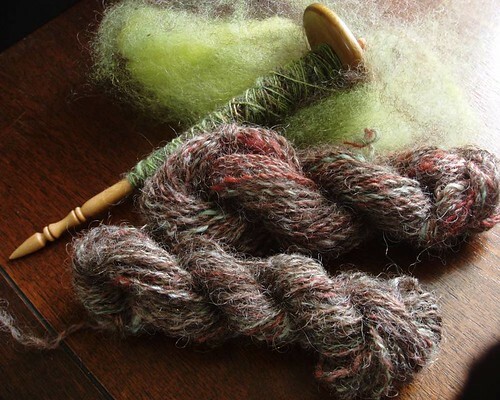 I am happy with the fact that you spun with a lovely spindle.